Here's a project for everyone. Help us identify the locations for some of Mary Fisher's great shots from the late fifties and early sixties. If you have any info on these photos, please comment. I love the old photos . . . nothing for sure, but could the last one be from the Judd Road area; off of South Saginaw? Happy Thanksgiving All! P.S. - I think I had that same outfit as the little girl in the first pic- what memories! I'm wondering if that first pic was taken in Mt. Morris. That first picture could be any one of a number of new subdivisions from the Fifties. Sarah could be correct although I tend to think of that area more as Beecher (Mt. Morris Township) than Mt. Morris (the city). The picture could also be Man-Ford Heights in Davison, I think. #2: Mott or Kearsley Park. Could it be Westwood or Westgate (can't recall the name) - it's a subdivision off VanSlyke... I don't recall the cross street... just know that if you drive down the road from Miller Rd KMart, take a right on VanSlyke, it is on the left. Not THAT familiar with that sub, so don't know if any of those streets curve or not, but that's the only place I could guess for photo 1. 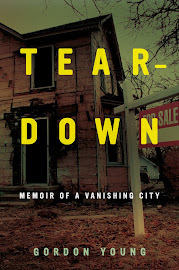 Hmmm, that last picture also looks like Flint Township, off of Beecher Rd. I could be wrong though. Velvet -- that's a good point on location. City of Flint required paved streets -- curb, gutter, concrete. 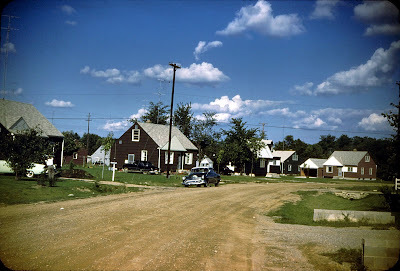 Some of the surrounding townships, in contrast, allowed gravel streets well into the late Sixties. Some, Gd Blanc Twp, for example allowed blacktop roadway with ditches. "Orchard Haven" off Perry Road, for example. Duh. Should have said curb, gutter, concrete pavement and sidewalks. Last photo kind of looks like the neighborhood area south of Corunna and Graham Roads...just a guess. I must correct my preious comment. I meant the first picture looks like one of the Flint Township subdivisions off of Beecher Rd. That's what I get for posting comments while tired. 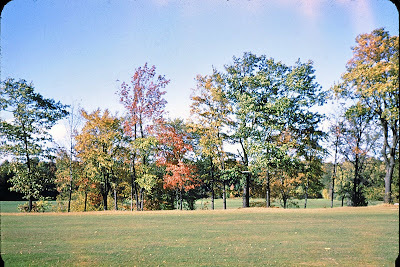 Love the pics- the park is too flat for Mott and Kearsley think it might be a park in the Mt. Morris area cant remember the name not far from Clio, the pic with the girl looks like Mt Morris area, the dirt road Buell Lake area? Looks like the street my aunt and uncle lived on in the early sixties. The brown house is the same. I love old photos too. The street in the last photo is to wide to be Judd Rd. in Burton Towndhip. Also, there were ditches on Judd Rd. back then if I remember right. Hi guys, I was born on S. Saginaw St. in 1940 & went to Holy Redeemer School, gratuated in 195? I've done some sleuthing, and can determine that the last photo is probably of a sub off Bristol Road, east of Fenton Rd. somewhere... Catalina Dr maybe? I agree with "anonymous" about the last photograph - it looks like that area off of Graham and Corunna. That was actually my very first thought, though I haven't been through there in years and I'm not 100% sure the houses in that neighborhood are actually spaced that far apart. Quite apart from township/city regulations, I always found it odd yet somehow fascinating that there were dirt roads and ditches in neighborhoods right in the middle of Flint. It was sort of like you didn't have to drive that far to be somehow "out of town" - at least that's what my North End perception of it was back then. I'm having a hard time placing the last photo as being in the Bristol Rd. area.....I grew up on Carmanwood off Bristol, near Fenton Lawn Elementary School (go Scotties!!) in the 1960s and 70s. Granted, I've been a Chicagoan since the late 80's...so my memories could be a tad hazy. One of the pictures, with the kid walking down the sidewalk, shows some radio towers in the distance. The one with the contraption on top looks like the WJRT-TV studio transmitter link microwave tower at 2302 Lapeer Rd. The other two towers could be WWCK AM and FM on Lapeer Rd. or WFLT (WAMM) on Averill. If you could see the rest of the taller tower, it would be the WWCK-FM tower, built in about 1964. WFLT/WAMM's two towers are the same height. I'm still working on the perspective of where this might be, but it looks like the east side from the towers being that close. One of the other pictures has a house that looks like some of the houses on Brookside Dr. The Park picture may be the park adjacent there, can't remember the name, and my maps are on the other computer. Come to think of it, they could all be looking south from a subdivision off E. Court, looking toward Lapeer Rd. Further analysis. I google mapped 2302 Lapeer Rd. From the vantage point in the first picture, it could be Commonwealth Ave., which is curved, and you could probably see the WJRT-TV STL tower and the WWCK towers looking south from that perspective somewhere along that street, or possibly Chalmers. It would have had to have been circa 1964 or later, when the 105.5 tower was built. 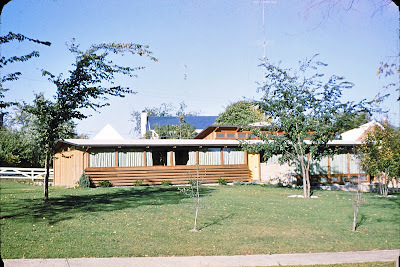 I remain somewhat confident that the park is Pierce Park and the house is one of the modern ones built on Brookside Dr. around 1960. Further analysis. The two towers on the left appear to be Master Antenna Television (MATV) towers on zoom inspection. Those were common in that era, serving various subdivisions, and many were owned by Darby and Son TV. MATV systems were used before Cable (CATV) systems were used, and are still common in large apartment buildings and institutional buildings such as schools and hospitals. I still think the other tower is the STL tower at WJRT-TV, but it could be in nearly any direction from that. However, it would still be likely to not be west toward downtown, because the houses are much newer and the street is curved. 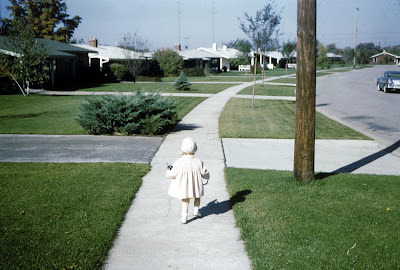 I still think that single circa 1959 modern house in the picure is on Brookside Dr. and the park probably Pierce Park. The shadows might give a clue. We know that it is probably late spring or early summer from the lawns being green without sprinkler systems. Possibly a cool late spring morning because the child has a coat on. I'm almost positive that the first picture is from the neighborhood off of Atherton and Van Slyke. I don't remember any names of streets except Lynbrook. And the last picture I'm almost positive is from "The Bronx" off of Fenton Rd between Hemphill and Bristol. It reminds me of Hull Dr where my uncle used to live. #1 is definitely not Gerholz. There were not any towers near the sub division. #2 looks like Mott park golf course. #3 is similar to a home out on McCandlish Rd. south of Grand Blanc. Or Grand Blanc Rd. east. #4 looks familiar and may be on Mandiville off Fenton Rd east. Near the Old Well Inn bar. If it is, then there is a story to be told about that black house in the middle of the picture. The towers on zoom look like MATV towers. They're taller than typical home TV installations, and have more antennas than most home installations would have. However, the third "tower", which looks something like an old microwave reflector repeater without zoom, on zoom is actually a telephone pole. The houses with carports like the one at the end of the street WERE very common in Westgate #1 and Westgate #2. The closest I can find is at the end of Cranbrook Circle, though on Google Maps the windows don't quite match. Surprisingly, there were a lot of variations on the front asymmetrical front gable ranch on a concrete slab with a carport on the right. On the third picture, the antenna "tower" is actually a TV antenna on a house, a two bay conical antenna (very common in the 1950s and early 1960s) on a rotator. A touch of class...or is it graft? Who wants to go for a dip? Hybrid Sales: See the Problem? As Bad As It Gets? Rev. Herbert M. Hart, R.I.P.